Some fantastic work is being done by the fellas at High and Tight. They've been keeping an eye on shop.mlb.com, because they have a tendency to foreshadow things a little bit with their jersey sales. 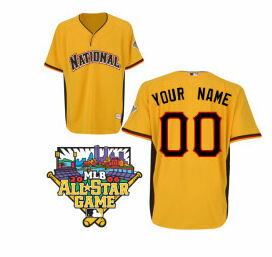 And on the page where you can buy an unsightly home-run derby jersey, they have listed as available options 24 AL players, and 25 NL players. The rosters aren't supposed to be officially announced until this evening. Oops. Now, unfortunately, they aren't complete rosters. There are 32 players on each team, so the suspense of which Royal is going to be deemed worthy still lingers. But if this is accurate, and I'm guessing it will be, it's a pretty neat little find. Thanks again to High and Tight for making the heads-up play.